LIGHT… what a marvelous creation it is! What a work of dazzling beauty! It is a thing of profound mystery, which concepts such as electrons and watts cannot even begin to explain. LIGHT speaks of radiant energy. That’s what light is like. And . . . that’s what God is like. God created all things in the beginning. And on that very first day of creation we read that He brought into being that which is so reflective of Himself. And He created Man—to have dominion over the world of light God had created. God’s angels joined in praise at the wonders of all God had made—His creation was full of light. God’s creation was full of light; and His supreme creations, Man and Woman, reflected His image. They were given the freedom to choose the path of light and obedience, or to seek their own way. They chose to rebel against their Maker, and found themselves plunged into darkness—not physical darkness, but spiritual darkness: separated from God by willful disobedience, they were engulfed in guilt and shame, dead in their own sins. It was the way of their own choosing. But God loved the human beings He had created, and was not content to let them suffer the deserved consequences of their own decision. The story of the Bible is the story of God acting to restore the broken relationship between Him and man, to again shine the light of life into people’s hearts. The Old Testament tells of God’s preparation for that great work of reconciliation. At the time of man’s fall, God in His mercy had hinted at an answer to the problem of sin (Genesis 3:15), a cure for the illness now in man’s soul, a light to shine into the darkness of man’s heart. Now He began to gradually reveal a glimmer of hope in the darkness of human history. One who would rule over all the earth. And so the level of expectancy and longing rose as the horizon of history grew ever brighter with the promise of the Light Who was to come. “Come forth, you maidens! Night is past. The Star of Jacob, the Sunrise from on High, the Light of the World (John 8:12), the Son of God—Jesus Christ—entered the world one silent, holy night. A beacon of light in the heavens summoned wise men from the East to Bethlehem. We see the theme of light once more as Simeon in the temple thanked God that he had been allowed to see . . . This special baby grew into manhood and then entered into a public ministry of about three years. 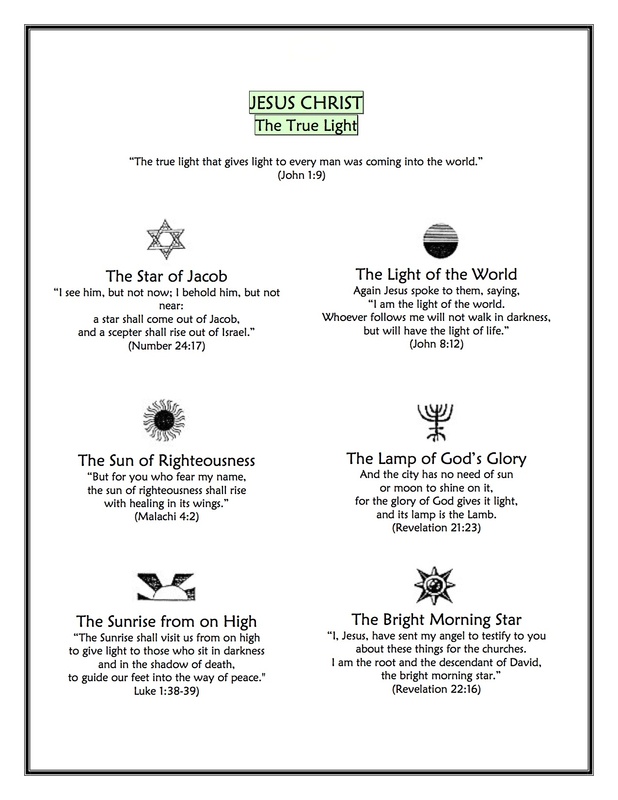 Jesus Christ called Himself “The Light of the World” (John 8:12). He was the fulfillment of all God’s promises of light in the Old Testament; He was the hope for those trapped in the darkness of sin. Finally, however, He was rejected even by His own people—the darkness of men’s souls resisted the light, and He was put to death on a cross for claiming to be who He indeed was: the Son of God, the divine Light come to a desperately needy world. He was crucified; and it seemed as though the darkness had won. But in a blaze of glory, Christ rose from the dead on the third day, and through His followers the message went forth into the world that Jesus had atoned for sin on the cross, that He had risen triumphantly in demonstration that God’s righteousness had been fully satisfied, and that the light of salvation and new life was available as a free gift to all who would acknowledge their darkness and come to Jesus, the Light of the World. He still shines into the hearts of all who let Him. His light and warmth can comfort and soothe and transform the most wretched of conditions. No life is so empty, no situation is so bleak, no circumstances are so hopeless, that He cannot shine in and bring new life, new hope, new reason for living, forgiveness, and a personal relationship with a loving heavenly Father. The light of Jesus shines brightly in this world. He invites all who have never done so to come to Him, to come to His light, by opening their hearts and receiving His salvation as a free gift through “the light of the gospel of the glory of Christ” (2 Corinthians 4:4). Jesus, Light of the World, shine upon us; set us free by the truth You now bring us. Blaze, Spirit, blaze; set our hearts on fire. Jesus shines in this world through those who belong to Him.True Christians are to reflect His light, to be like Him as He shines into all the dark corners of our lives and changes us. May we who are His, faithfully reflect His glory and light to those around us who need Him also. As we gaze on Your kindly brightness, so our faces display Your likeness. Ever changing from glory to glory, mirrored here may our lives tell Your story. Shine on [through] me, shine on [through] me. That’s what light is like. And . . . that’s what God is like. Christmas is the celebration of the bursting forth of God’s glory, purity, and holiness into human experience, in the person of Jesus Christ. Christmas is the season of light, because it is the story of the coming of Jesus Christ, the Star of Jacob, the Sunrise from on High, the Sun of Righteousness, the Bright Morning Star, the Lamp of God’s Glory, the True Light. Christmas IS Jesus Christ, the Light of the World. O come, let us adore Him!! IN WORSHIP NOTES 1.12, 2.12, 3.12, 4.12 and 5.10 HERE, and in 6.12 HERE.